Drinking fresh juice will bring out the glow in your face. There are many needed nutrients in fruits and vegetables that will help improve the beauty of your skin. Drinking juice is a quick and easy way to get all the benefits from fruit, especially if you do not enjoy eating the fruit. It also provides a natural detox for your body which leads to clear, healthy skin. You will find 10 powerful juices that promote vibrant and radiant skin below. A fantastic juice for glowing skin is simple apple juice. The antioxidants in it help slow down the signs of aging such as wrinkles. It also helps your skin remain soft and radiant. If you want a great punch of iron, potassium, niacin, copper and vitamin C, opt for beet juice. You will also receive all the anti-inflammatory benefits, plus calcium, manganese, magnesium, zinc and folic acid. Beet juice will help flush your liver and cure skin conditions for healthy, glowing skin. Carrots are a powerhouse juice for glowing skin. Carrots have a large amount of beta carotene, which is a powerful vitamin A that helps prevent degeneration of cells, slows aging and keeps skin glowing. The vitamin A found in carrot juice also helps keep body tissue, eyes, bones and teeth healthy. Carrots also have a large amount of vitamin C, which promotes collagen growth to keep the elasticity in the skin. They also aid the body in maintaining electrolyte balance, reducing acne and dark spots, as well as scars. Ginger juice adds the great health benefit of boosting your immune system. It contains magnesium, potassium, manganese and vitamin B6 for anti-inflammatory benefits. Adding ginger to other juices also adds natural anti-aging antioxidants. The high level of antioxidants in grape juice makes it great for removing acne and signs of aging. Grapes are commonly used to make a great fruit juice for glowing skin. Kale packs a powerful punch of nutrients in its green leaves. It is a natural anti-inflammatory that fights acne and other skin conditions. It is also great for cleansing your colon. Kale is a great source for vitamins A, B1, B2, B3, C, E, K, beta-carotene, calcium, copper, iron, phosphorous, magnesium, omega-3 and omega-6 fatty acids, which are all good to your skin and health. Lemon juice provides many food and medicinal benefits. With a high content of vitamin C, citric acid and B vitamins, it helps purify the blood, cleanse the kidneys and rid the body of other toxins. Parsley is an herb that you can add to any juice to help clear up blemishes for an even skin tone. It is also a juice that aids in preventing bladder infections by keeping the urinary tract, liver and kidneys clean. The vitamin K makes parsley a great juice for glowing skin. Even when the skin seems beyond repair, a daily glass of pomegranate juice will help clear and heal the skin. The natural anti-aging properties of pomegranates make it a powerful skin repair remedy for naturally glowing skin. Watercress also helps cleanse the blood and liver along with providing antioxidants for healthy, glowing skin. The high levels of sulfur focus on clearing the skin's complexion. A portion of watercress will provides half the recommended daily intake of vitamin A. It is also a good source of vitamins C, E, and K, beta carotene, B vitamins, folate, iodine and calcium. Always consult your physician before making a big change to your diet. When making juice, use raw fruits and vegetables for the highest amount of needed vitamins and minerals. Aim for organic fruits and vegetables for a healthier variety. If you cannot purchase organic, be sure to clean them thoroughly. 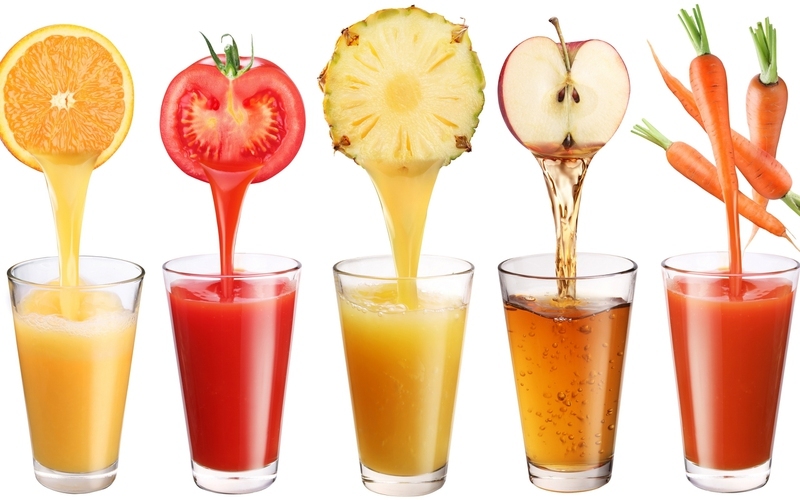 Consume the juice as soon as possible after juicing because of the quick oxidization. Dilute your juice with water because they are usually high in sugars. You only need to make half of a serving size and add water. Juicing alone will not provide complete improvement to your body. Be sure to include a proper diet and exercise routine to create optimal health.